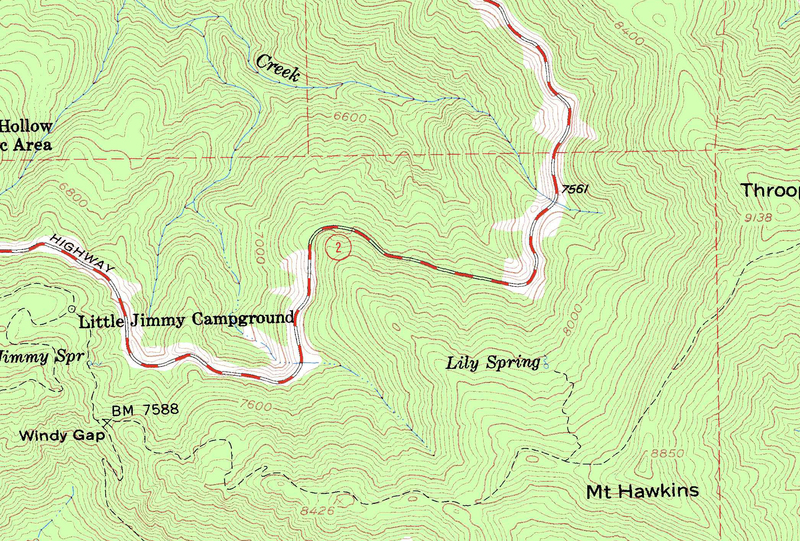 Here are links for downloading maps of the Lily Spring area. These are cropped from the USGS 1:24000 topographic map, Crystal Lake. Various places on the internet dscribe how to read a USGS topographic map, including an explanation of the Public Lands Survey System, i.e. how to record specific locations. A good reference is Paradise Valley Community College. Map with Sawyer's survey area marked, as per his Crossosoma paper. Resolution 2091 x 1414 pixels. This map includes the Section boundaries and divisions, which may be of use for recording plant locations when no GPS receiver is available. Map with Sawyer's survey area marked, as per his Crossosoma paper. Resolution 2091 x 1414 pixels. Map with no markings (does not show Sawyer's study area): Resolution 2091 x 1414 pixels. 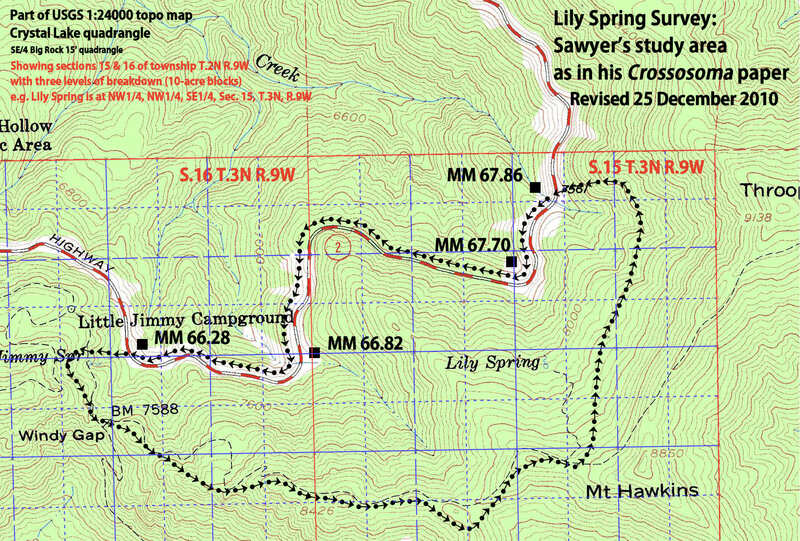 The LSAS field reports make occasional mention of location with respect to seven crests along the ridge that forms the southern boundary of the study area. During the survey we often referred to these as Crest 1 through Crest 7, numbered from west to east. Click here for a map showing the seven crests (1200 x 800 pixels, 236 KB), as located by a personal GPS receiver, accuracy 10 feet. Here are the elevations and geographic coordinates of the seven crests. Crest 6 is close to the intersection of the Pacific Crest Trail (PCT) and the trail sothward to South Mt. Hawkins. Crest 7 is at the top of Claude's Ridge, which extends downward in a northwesterly direction to the highway. Note that the crests are all slightly south of the PCT because in the study area the PCT does not go along the actual crest except in a few places such as at Windy Gap. Here are the elevations and geographic coordinates of some other locations frequently discussed and noted by survey participants. Regarding the Mile Markers (MMs) on Angeles Crest Highway (State Route 2), note that MM 62.28 is approximately the western boundary of the study area, whereas MM 67.86 is close to the eastern bounday of the study area. 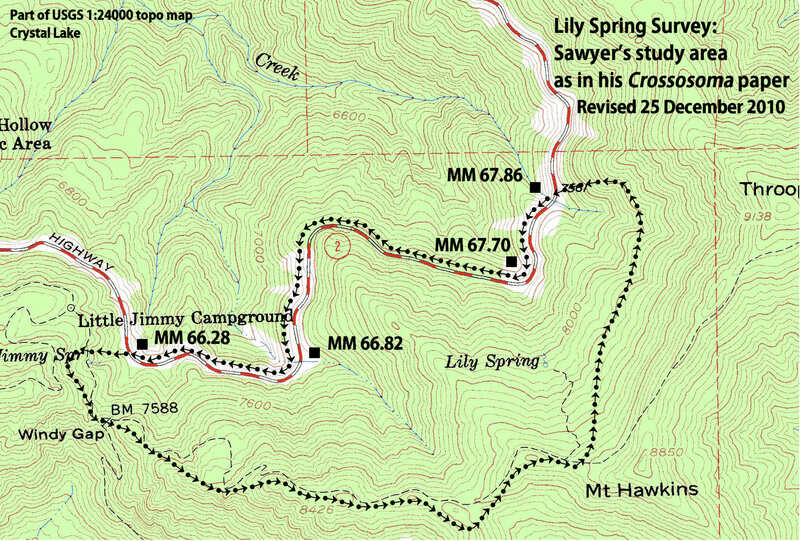 The location of MM 67.86 may be uncertain as it appears to have been moved during the study period, the actual boundary of the study area being on the eastern side of the drainage gully where that MM is located (South Fork of Big Rock Creek). The horizontal accuracy standard requires that the positions of 90 percent of all points tested must be accurate within 1/50th of an inch (0.05 centimeters) on the map. At 1:24,000 scale, 1/50th of an inch is 40feet (12.2 meters). The vertical accuracy standard requires that the elevation of 90 percent of all points tested must be correct within half of the contour interval. On a map with a contour interval of 10 feet, the map must correctly show 90 percent of all points tested within 5 feet (1.5 meters) of the actual elevation. Note that roads shown on the map are as per the aerial photogrammetry of 1957/58, when the Crystal Lake map was made. In some places the road locations have changed. There are also trails shown that no longer exist, and more recent trails that are not shown. Although these maps were updated in 1972, it's possible that little or no updating was done on this particular map because of the remote location. - Click the “+” sign after the requied item(s) in the list. - Click the Download link(s) associated with the Download Cart. Note: The above procedure was verified in January 2015. The procedure changes slightly from time to time as USGS update their web site. At the time of creating this web page, the download from USGS was a PDF file with a size of 13.7 MB. (It may now be a different size.) In order to crop the map to show just the LSAS study area, Adobe Acrobat was first used to save the file in TIF format. (This generated a very large file, 182 MB. It could also be saved as a JPG file, which was only 25 MB, but that format loses some of the image quality.) Then PaintShop Pro was used to crop the image and create the files listed above for download. (One could also use Adobe Photoshop for this.) The USGS web site also has a mechanism for cropping files. All text is Copyright © 2010-2019 CNPS San Gabriel Mountains Chapter unless otherwise indicated.